When I was growing up as a child, in Portugal, I remember that one of my favorite things to eat were the Bolas de Berlim. These wonderful donuts filled with vanilla cream inside, I mean, anytime we would go to a Pastelaria, that is what I would order, or the Piramides....OH my, haven't had one of those in about 20 years. 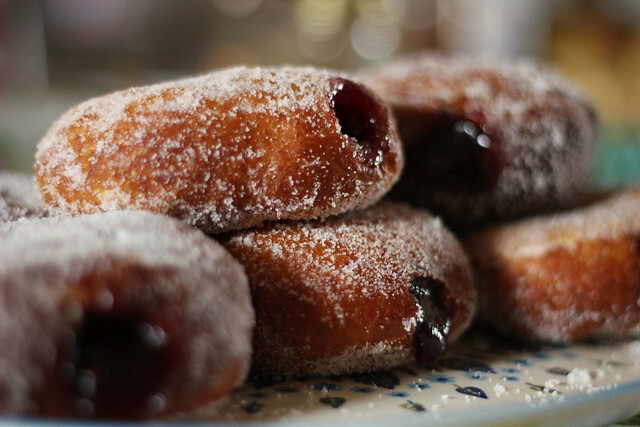 But since moving to South Africa and then here to the States, I haven't had any, other than jam or custard filled donuts, which I adore just as much. With all things baking wise, I usually shy away, I am more of a cook and have never been much of a good baker, for some reason dough and stuff like that just scares the bejeebers out of me, but over the past few years I've been trying to conquer that fear and just get my hands in the dough, so to speak. Anyway, here it is, go make yourself some of these and then make sure you hide one at least before they disappear off the plate. recipe from What's Cookin, Chicago? In a medium sized mixing bowl or bowl of your stand mixer, combine the yeast, sugar, dry milk, salt, baking powder, egg, water, shortening and flour. Knead the dough with the dough hook attachment until it's smooth and supple, adding additional flour as needed. Cover the dough and allow it to rise for 1 hour; it won't rise much, if at all. 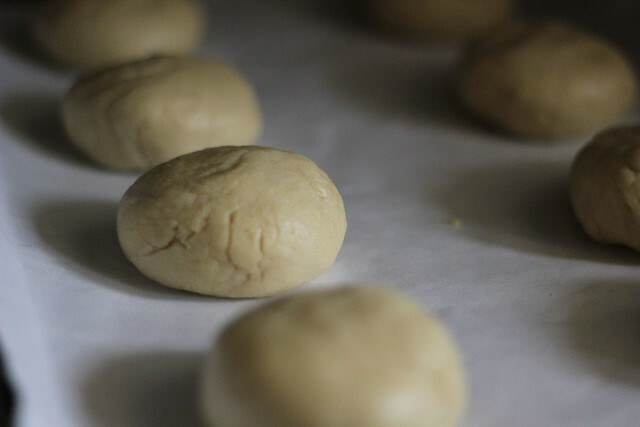 Transfer the dough to a lightly greased work surface. Divide the dough into 8 pieces. Round each piece into a ball, then flatten each ball slightly. Place the balls on a lightly greased or parchment lined cookie sheet, cover them with creased plastic wrap, and allow them to rest for 2-2 1/2 hours. Again, they won't rise much. About 10 minutes before the end of the rising time, heat the oil in a deep fryer or in a deep saucepan and heat slowly to 375 degrees. 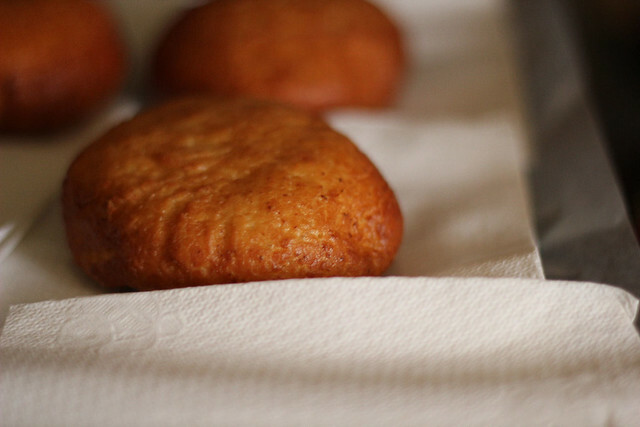 Fry the donuts, two to four at a time (depending on the capacity of your pan) for 3 minutes on each side or until they're a deep brown, but not burned. Transfer them to a paper towel lined cooling rack to drain. 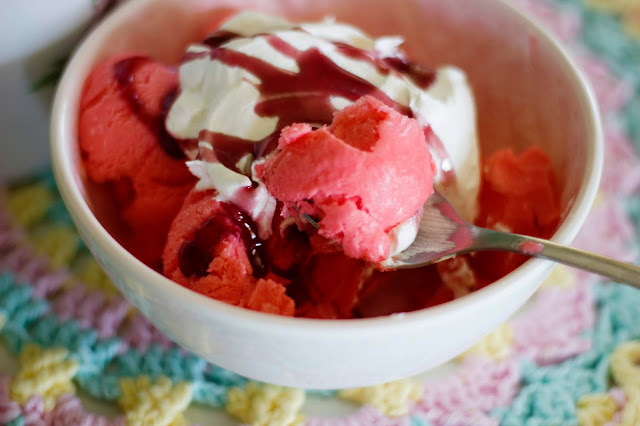 When the cool enough to handle, fill them with about 2 tablespoons of blackberry jam or jelly each. An easy way to do this is with a cookie press pr pastry bag equipped with a filling tube. 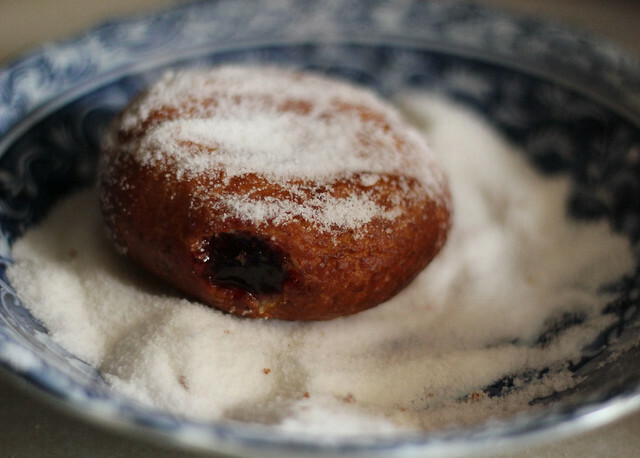 Or you can use a thin spoon and make a hole in the doughnut and spoon the jam/jelly in the middle. After filling, roll in sugar. Oh yum! 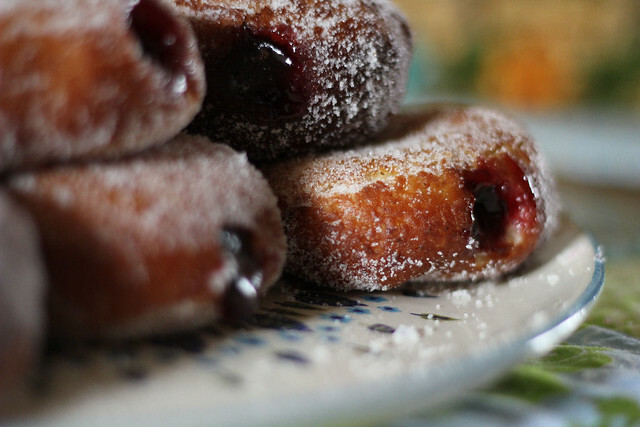 I love love love cherry filled donuts! These look great! I'm a couple days late for "International DeLurking Day", but here I am. These look wonderful. The key to baking is to keep doing it, over, and over & over till it becomes second nature. You'll get to know by "feel" if your dough is "right" and what to add to make it so, over the years. Even if you do have failures (which I find hard to believe LOL), you most certainly have tasters/testers who won't mind trying every single batch! I can hardly wait to see your next attempt. These look amazing! 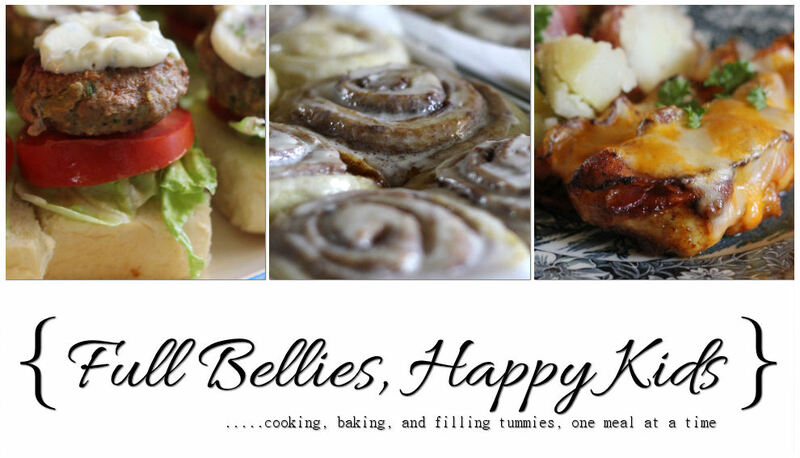 I am going to make them today! !